Or view larger version. Fort Ross. ca. 1880s. Henry Raschen, artist. Oil paint on canvas. Collection of Oakland Museum of California. Lent by the Mann Family Trust. 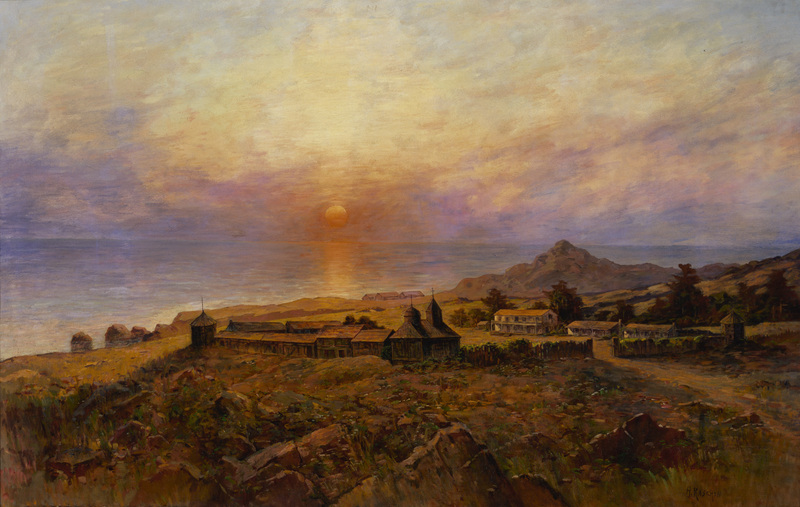 This is an oil painting by Henry Raschen of Fort Ross. Fort Ross was a Russian-American Company settlement from 1812 to 1841. This commercial company, chartered by Russia's tsarist government, controlled all Russian exploration, trade and settlement in the North Pacific and established permanent settlements in Alaska. Fort Ross was the southernmost settlement in the Russian colonization of the North American continent, and was established as an agricultural base to supply Alaska.